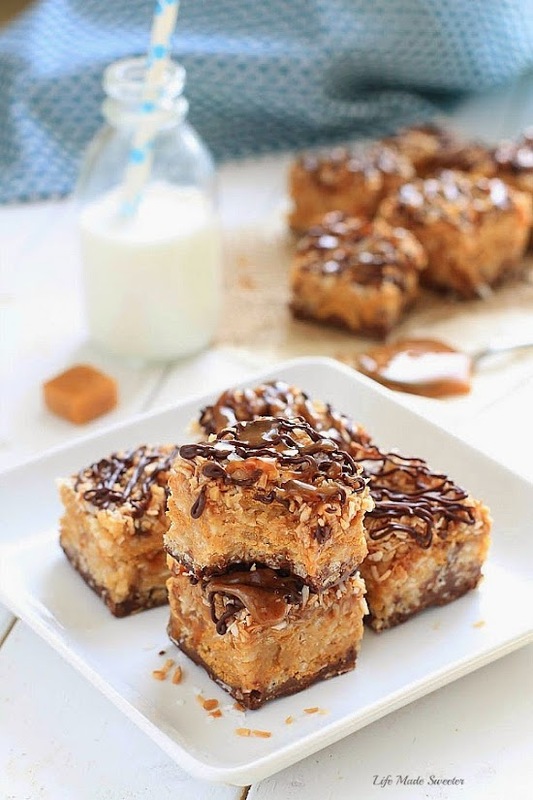 These easy no-bake cereal bars combine the beloved caramel, chocolate and coconut flavors of the Samoa Girl Scout cookies with peanut butter. It’s that time of year again! Samoas are by far my favorite and to me the best Girl Scout cookies! 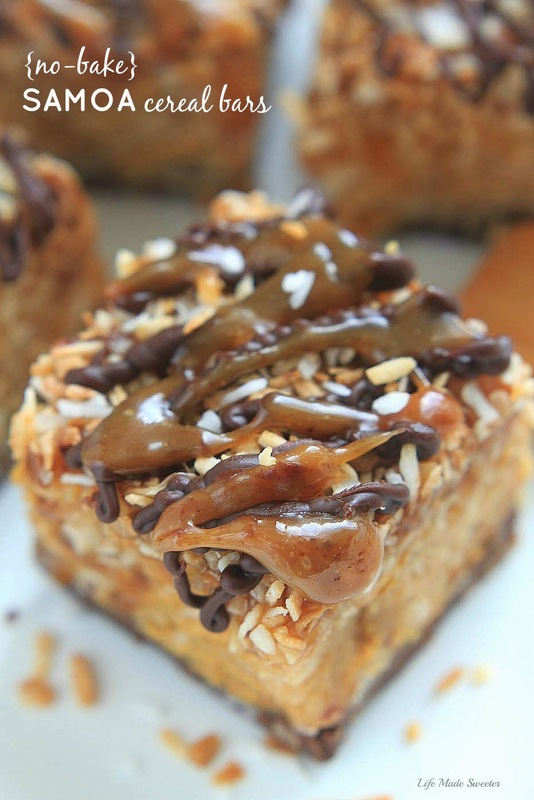 There are tons of homemade Samoa cookie versions floating around the web which I have tried and love but I knew that I wanted to incorporate these beloved flavors into a no-bake bar version. The base of the bars is a combination of rice cereal, honey graham cereal and creamy peanut butter. The topping is a layer of toasted coconut, caramel sauce and chocolate ganache. And just like the girl scout cookie, the bottoms are also dipped in chocolate ganache. 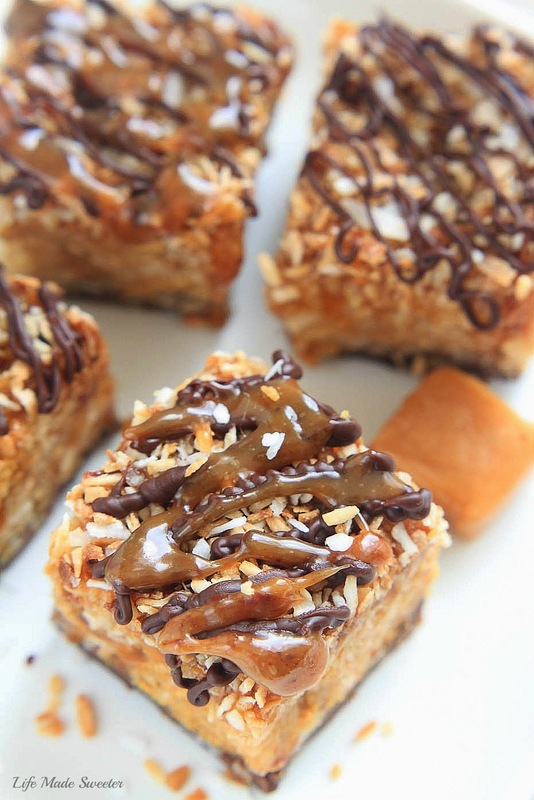 So you basically get that sweet and saltiness plus everything you love about Samoa cookies in one delicious no-bake treat! 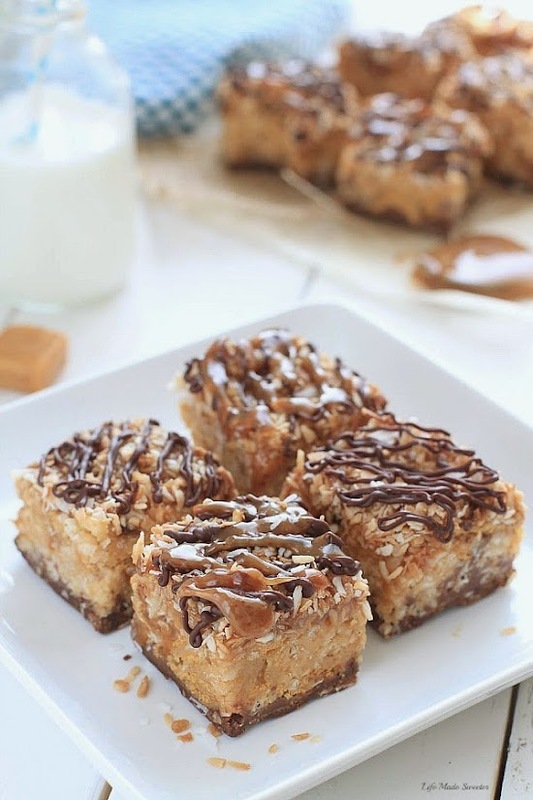 Samoa Peanut Butter Cereal bars combine the beloved caramel, chocolate and coconut flavors of the popular girl scout cookies with peanut butter, Rice Krispies and Golden Grahams cereal. In a large pot, heat honey over medium heat until boiled. Remove from heat and immediately sitr in peanut butter until completely combined. Add vanilla extract. Gently stir in both cereals and 1/2 cup of shredded coconut until completely coated with peanut butter mixture. Press FIRMLY into the prepared pan. Sprinkle 1/2 cup of the toasted coconut evenly over the bars. Pour caramel sauce over and sprinkle the remaining coconut on top. Chill in the freezer until the bars set - around 30 minutes - 1 hour. Place cream in a small saucepan over medium heat and bring to a simmer. Pour over chocolate and allow to sit for 10 seconds before stirring with a spoon. Allow to sit and cool slightly before using. Line a large cookie sheet with parchment paper. Cut chilled bars into equal squares. Dip the bottom of each bar into the chocolate ganache and lay upside down on the lined cookie sheet allowing the chocolate to set and dry. Repeat with remaining bars. Place the tray in the freezer or fridge to set quicker. Once the chocolate has set, turn the bars over and using two separate ziptop bags with the corner cut off - drizzle the top of the bars with caramel sauce and melted chocolate or chocolate ganache. Luckily for me, I am passing them off to Lindsey over at American Heritage Cooking to help me finish them off. Head on over to hear to more about Lindsey’s culinary adventures and be prepared to drool over everything that Lindsey makes!